Unfortunately, your registration has been declined by the auctioneer. You can contact the auctioneer on +44 (0)7756 070198 for more information. You are the current highest bidder! To be sure to win, log in for the live auction broadcast on 11 Feb 2019 10:30 GMT or increase your max bid. If requested we may be able to help you with shipping at a very competitive price. This shipping will be at Bidders own request & therefore fully at own risk. All items that we agree to ship will be packed to the best of our ability, however as mentioned, any loss or damage will be fully the responsibility of the Bidder & no responsibility will lay with Clarks Auction Rooms, its Vendor or the chosen Courier. Please allow upto seven working days for dispatch of said items. These Terms are fully non-negotiable without exception. Please note some items we cannot ship so please request shipping quote prior bidding. In the very unlikely event of a return being accepted, the Bidder pays for the return shipping. The original shipping will not be refunded. If you want your parcel fully insured then we recommend Mail Boxes Etc. of Plymouth who offer a professional packing & shipping service to suit bespoke requirements. This is a public auction. Viewing times have been provided for buyers to ascertain that all their lot interests meet their required expectations. Alternatively we will try to answer questions about said interests provided enquiries have allowed enough time. Condition reports or other details will not be provided after you have won the lot. All lots Sold As Seen. We shall endeavour to get an emailed invoice out to you with payment details within 24hours of auction end. Failure to settle your account within seven days of sale end may result in us blocking your saleroom.com account until payment has been received or even indefinitely. Phone bids are accepted on lots of £100 guide price or more. By choosing to place a telephone bid it will be deemed that you wish to automatically at least meet the reserve of the lot or the lower end guide price figure, whichever is lowest & that the auctioneer may wish to start with your said bid in the first instance. Bank transfer prefered for non-local buyers. Debit card (in person only). Credit card for non-EU upto £50 for overseas buyers plus 2.5%. Cash in person. Please do not send cash in post. We do not accept Paypal under any circumstances. Due to attempt of fraud by a registered saleroom.com bidder we no longer accept card payments over the phone. Debit cards are acceptable in person. Credit cards are no longer accepted from UK & EU buyers. Cheques are no longer accepted from online bidders. Without any exception, any shipping we offer or that is requested is entirely at bidder own risk & thus sent uninsured. Uninsured postage & packing include actual cost, packaging materials, labour & VAT. Our minimum shipping charge from January 1st 2018 is £10 plus VAT. We are happy to combine shipping. We aim to ship 5-7 works days after payment has been received. Whilst every care is taken, in the event of a loss or damage, as a middleman, we cannot & do not get involved with the making of any claims, irrespective of shipping methods. See below re. making own arrangements. Buyers are more than welcome to make their own arrangements but please ensure all lots are removed within two weeks of sale at latest. We fully reserve the right to re-sell lots that have not been collected by the following sale as "A" lots less admin, storage & our regular costs. Buyers are fully responsible in ensuring that thesaleroom.com have their correct & uptodate shipping address & contact details. We are not responsible for maintenance of the private information of the-saleroom.com online customers. Please note if you pay late outside our Terms we reserve the right to withdraw any offer of shipping. Bidders are again reminded that this is a public auction. You are required to satisfy yourselves that all lots meet any exacting expectations. You can do this by viewing in person or requesting further information preferably via email. As already mentioned, all lots sold as seen. If you bid we shall assume you agree to all of our Terms & Conditions. If you are not happy with any of our Terms then simply please do not bid. Thank you for your cooperation. Our buyer premium is 17.5% plus VAT. From November 1st 2018, the saleroom.com charge you through us a live bidding premium of 4.95% plus VAT. Late payments from the-saleroom.com bidders are having an adverse affect on the way we run our business & have increased our costs considerably. We require payment within seven days of the sale without exception. If you chose not to settle your account we reserve the right to withdraw any offer of shipping that may have been added to your invoice or sell the lot to any underbidder. If the lot remains uncollected it will be sold at the next sale without reserve & any costs set against your account. Jewellery lots: We try our level best to get descriptions correct however we are unable & cannot be expected to identify if an item is natural, treated or otherwise hence all lots "sold as we see them". Please request further images or view the sale to ensure lots meet any exacting detail or requirements required. Remember this is a public auction not retail. iii Any additional notices and terms printed in the sale catalogue in each case as amended by any saleroom notice or Auctioneer’s announcement. “Auction” means an auction undertaken Clarks Auction Rooms. “Sale Room” means Clarks Auction Rooms site premises from where the Auction is conducted. “Auctioneer” means Clarks Auction Rooms, its team, representatives, and person and persons for the time being authorised by the Auctioneer to have the conduct of an Auction. “Bidder” means any person who has registered with the Auctioneer and has been issued with a Bidding Number for an Auction. “Bidding Number” means the unique bidding number assigned to the Bidder upon registration with the Auctioneer for an Auction. “Deposit” means the amount stated by Clarks Auction Rooms to be placed in order to bid. “Hammer Price” means the highest bid for any Lot accepted by the Auctioneer at an Auction. “Lot” or “Lots” means any individual single or otherwise part of a consignment put up for Auction by the Auctioneer. “Purchaser” means the highest Bidder for any Lot. “Purchase Price” means the sum total of the Hammer Price plus VAT (where applicable) and the Buyer Premium plus VAT. “Vendor” means the seller of any Lot. “Vendor Commission” means the percentage payment as detailed in the Catalogue or stated and due by the Vendor to the Auctioneer upon the sale of any lots. “Visitor” means person who enters the site to make enquiry, to view the sale or any other means other than registering to bid. Bidder & Visitor acknowledge that a Sale Room is a potentially dangerous place. Large pieces of furniture, some glazed, are present, loose rugs are on the floor, some lots may have sharp edges, this list is not exhaustive, care must be taken. Every person at the Auction site at any time shall be there at their own risk with notice of the condition of the premises and the activities thereon and Bidder shall so advise his Agents and Employees. No person shall have any claim against Auctioneers, their Agents, Employees, or Principals for any injuries sustained, nor for damages to or loss of property which may occur from any cause whatsoever. 4. All Bidders are required to register before entering the Auction. The Auctioneer shall have the right, at its discretion, to refuse any person admission to the Sale Room or attendance at any Auction. 5. On registration, the Auctioneer shall be entitled to require Bidders name, address & contact details. 6. The Auctioneer has absolute discretion without giving any reason to refuse any bid, to divide any Lot, to combine any two or more Lots, to withdraw any Lot from the Auction and in case of Dispute put any Lot up for Auction again. 7. The Auctioneer reserves the right to revoke any Bidding Number at any time. 8. The highest Bidder for each lot shall be the Purchaser thereof if the Bid is accepted, and in the event of any dispute the Auctioneer shall have absolute discretion either to settle such dispute or to re-offer the Lot immediately. Highest bidders must settle their accounts within seven days of sale end. 9. No person may advance less at a Bid than a sum to be named from time to time by the Auctioneer. 10. The Auctioneer sells as an agent for the Vendor and as such is not responsible for any default by Vendor or Purchaser, and in particular shall not be liable to pay the Vendor until payment is received from the Purchaser. 11. Without prejudice to the generality of clause 10, all Lots are sold as seen irrespective of faults and imperfections and errors of description. Illustrations and descriptions in catalogues or brochures are for identification only. Descriptions in each case are provided by the Vendor. All Lots are available for inspection and Purchasers should satisfy themselves prior to the Auction to as to the condition of each Lot and should exercise and rely on their own judgement as to whether the Lot accords with its description. The Purchaser of any Lot is deemed to have inspected the Lot prior to purchase. The Auctioneer gives no warranty as to the description; conditions and other terms implied by statute or common law are, to the fullest extent permitted by law, excluded from the Agreement. The purchaser agrees he has satisfied himself and is not relying on the Auctioneer, nor are the Auctioneer liable, for any matter in respect of the above. Bidder further agrees to repair, at his cost, any Lot purchased at the Auction to a safe operating condition and, without limitation, to a condition which meets any standard or requirement of any applicable authority, law or regulation including those concerning any use to which the Lot may be out. 12. Care has been taken to ensure the accuracy of the catalogue & to ensure lots are fairly represented but no sale shall be invalidated by reason of any defect or faults in any of the Lot(s) or by reason of any of the Lot(s) being incorrectly described in the catalogue or by reason of any of the Lot(s) having errors in any requested condition reports and no compensation shall be paid in respect of any such faults or errors in description be it written or verbal. Any online images shown generally represents the product but there are no guarantee to exact colour being reproduced. Any sizes or weights offered are purely as a guide only & are not guaranteed. Primarily all prospective buyers must satisfy themselves with the condition, authenticity & accuracy of any catalogue description of a lot prior bidding. Any images, logos or text on this website may not be reproduced, downloaded or copied in any shape or form without prior written consent of Clarks Auction Rooms. Thus all lots sold as seen. 13. The Auctioneer may offer Lots to internet bidders using its online service; however, Auctioneer shall not be liable for any claims or costs arising from its failure to do so. Inaccuracies in the catalogue or on the internet will under no circumstances relieve the Purchaser from responsibilities acted by Bidder Registration. 14. Without prejudice to clause 11, all Lots are sold without CE Marking unless specified otherwise. If any Lot has been described as CE Marked, the Purchaser acknowledges that this description has been provided by the Vendor. The Auctioneer makes no warranty as to the accuracy or authenticity of any CE Marking on any Lot. 15. The Auctioneer will use reasonable endeavours to ensure that all Lots appearing in the catalogue for sale are presented for sale at the Auction but the Auctioneer accepts no liability for loss or damage howsoever arising (included but not limited to costs of attendance of Bidders at the Auction) in the event that any Lot is withdrawn or otherwise is not presented for sale at any Auction. Our VAT reg. no. 234 6136 23. VAT is payable by the Purchaser on the Buyer Premium of all Lots at 20%. All Vendors will be charged VAT on the agreed Commission rate at the rate of 20%. All shipping, collection charges or any other services we provide where charged are subject to VAT. 17. All damages to Vendor Lots caused by Bidder or Visitor must be paid for in full at highest end of estimate as well as to include any buyer premium & VAT. 18. Shill bidding at our saleroom is strictly prohibited under Consumer Protection from Unfair Trading Regulations 2008 & teh Fraud Act 2006. It is an imprisonable offence. 19. Each Lot shall be at the Purchaser’s risk from the fall of the hammer but must be paid for in full by cleared funds before ownership in the Lot passes to the Purchaser. The Purchaser agrees to insure the purchased Lot against all losses from the Auction until removal of the Lot by the Purchaser. 20. The Purchaser, or its servants or agents, will be responsible for the loss or damage to the Lots purchased from the time of the Auction and neither the Auctioneer or its servants or agents shall afterwards be responsible for any loss or damage of any kind, whether caused by negligence or otherwise, while any Lot is in their custody or under their control. 21. The Purchaser shall at its own expense take away the Lots purchased within three working days but not later than 2 weeks after the day of the Auction but not before payment to the Auctioneer of the Total Invoice Price. If any Lots are not so taken away by the Purchaser within the specified period Clarks Auction Rooms reserves the right to sell the item(s) at the next Auction without reserve and forward all monies to you less Vendor Commission. Furthermore, where goods by agreement are stored after an Auction at the Purchasers’ request on either the Vendors or Auctioneers premises, the items so stored will be entirely at the risk of the Purchaser and no responsibility can be accepted by either the Vendor or the Auctioneer for loss, damage or destruction thereby arising. The Purchaser is required to collect all purchased lots within seven days. The Auctioneer takes no responsibility for uncollected purchased lots. 22. Bidder acknowledges and agrees that the acquisition, delivery, export, and ownership of certain products or source of funds for such products are subject to international, federal, state, and local regulations. Bidder expressly represents that it is presently in full compliance with and shall continue to comply with all applicable international, federal, state and local laws, statutes, ordinances and regulations relation to the acquisition, delivery, export, and ownership of any Lots as may be required by Bidder. 23. Any damage done to the Sale Room fixtures & fittings at which the Auction takes place by the Bidder or Visitor, including agents or servants of theirs, will require said damage to be made good. 24. Neither a Bidder nor any person affiliated with, or as agent of, a Bidder shall collude with any Vendor or any other Bidder in the making of bids for Lot at the Auction. 25. Vendors may not bid on for any Lot or Lots they have entered for Auction. If so this will result in the Vendors being charged all Commission lost on the sale/invoice amount. 26. It is the responsibility of those Vendors leaving in items to be sold to ensure if such items have been sold at the auction and if not to make arrangements for their collection. 27. All items not sold during the Auction must be collected within 2 weeks of that auction or the period specified. If items are not lifted within the specified period Clarks Auction Rooms reserves the right to sell the item(s) at the next auction without reserve and forward all monies to you less Vendor Commission. 28. Upon failure to comply with any of the conditions and terms of sale said Bidder will face immediate ban from our Sale Room. 29. The Auctioneer is prepared to accept Commission bids on behalf of any intending Purchasers who are unable to attend a sale provided such Commissions are given in writing, in which event they will be carried out free of charge to the intending Purchaser. The Auctioneer is not responsible for, nor in any way connected with, Commission to purchase Lot(s) given to any member of staff other than by the Auctioneer. 30. Neither the Vendor nor the Auctioneer accept responsibility for duties (if any) by the Health & Safety Act 1974 or any other statutory provision and the Purchaser accepts responsibility for ensuring that the requirements of any such statutory provision are complied with. 31. References to acts of parliament shall be deemed to include all acts, orders and statutory instruments enlarging, re-enacting or amending the same as in force from time to time. 32. All items entered for auction are at Vendors own risk. Insurance covers fire & theft only. 33. This Agreement can only be amended or varied by written agreement between the parties and constitutes the entire agreement between the parties and overrides prior contracts or agreements or understandings between the parties in relation to the sale by Auction and ensures for the benefit of and is binding upon the heirs, executors, administrators, successors in title and assigns of the parties herein. 34. The Purchaser accepts that Auctioneer may vary the invoice in relation to lots bought as a direct result of errors in buyer numbers during sale day. Auctioneer will endeavour to minimise this possibility at all times; however, buyers will accept lots bought at auction. 35. The formation, existence, construction, performance, validity and all aspects of the Agreement shall be governed by UK Law and the parties submit to the non-exclusive jurisdiction of the UK Courts. 36. At Auctioneer discretion, charges may apply to Lots that have been withdrawn prior sale, applicable to those that have been marketed and/or researched. Said lots may be withheld for until said charges are satisfied. Charges may include a percentage of advertising costs & hourly rate of £30 for research costs, both plus VAT. 37. All items of post 1950 furniture included in any sale are offered for sale as works of art. The items may not comply with the Furniture and Furnishings (Fire) Safety Regulations 1988 and for this reason, they must not be used in a private dwelling. 38. Online bidders MUST pay for lots within seven days of sale end unless prior agreement in place & remove said lots within two weeks. Failure to collect lots within this time frame may incur storage charges of £1 per lot per day irrespective of lot size at the auctioneers discretion. We reserve the right to sell or withhold uncollected lots until all storage costs incurred are settled. 39. If requested we may be able to help with shipping. However please note whilst we endeavour to ensure items are packed securely & carefully all shipping is totally at winning Bidder own risk without any kind of exception, even if errors of our making. In the unlikely event of an accepted return the winning Bidder pays the return shipping. Please allow upto seven working days for dispatch. We would recommend Mail Boxes Etc who offer a professional packing service & can fully insure higher value antique items. 40. 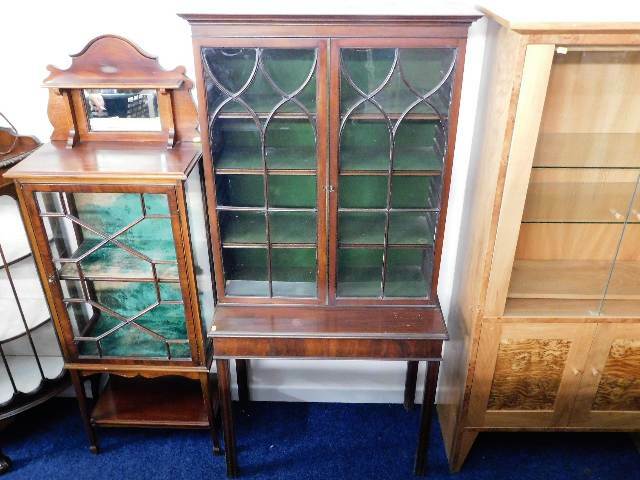 Phone bids are accepted only for lots with a catalogue guide of £100 or more. If a phone line is booked it will be taken on the assumption that you are willing to at least bid the reserve or the bottom end of the estimate & if no other bids are forthcoming then your booking a phone bid will be taken as a legally binding bid at said level. No reserve is higher than the bottom estimate. 41. Purchases to be paid for by cash, bank transfer, debit card (chip and pin only) & cheque (only by prior agreement – seven work days will be required for full clearance from day of banking). Debit cards accepted upto £100 for over the phone transactions. UK & EU credit cards are no longer accepted. Non-EU bidders can use credit cards upto £50 only at the auctioneers discretion. A 2.5% charge will be applicable. Title of all purchased goods remains with the Vendor until payment has been received by Clarks Auction Rooms and cleared through our Bank. If payment has been accepted by Cheque the purchaser is to make good that payment should payment default. 42. Our buyer premium is 17.5% plus VAT. If bidding via the-saleroom.com live bidding platform a further 4.95% which is subject to VAT will be in addition to the hammer price. If using easyLiveAuction.com then an additional 3% plus VAT maybe due. 43. Negative or threatening behaviour towards any member of our team, be it verbal or physical, is not tolerated in any capacity. As a result of such behaviour your account to be automatically suspended & trade with you will cease thereafter. You will though remain fully liable for any loss of our earnings but you will lose all rights to purchase. Reneging on purchases will result in an immediate ban. 44. Artist’s Resale Right indicates works which may be subject to the Droit de Suite or Artist’s Resale Right which took effect in the UK on 14th February 2006. We are required to collect a royalty payment for all qualifying works of art under new legislation which came into effect on 1st Jan 2012; this applies to living artists and artists who have died in the last 70 years. This royalty will be charged to the buyer on the hammer price and in addition to the buyer’s premium. It will not apply to works where the hammer price is less than €1,000 (euros). The charge for works of art sold at and above €1,000 (euros) and below €50,000 (euros) is 4%. For items selling above €50,000 (euros), charges are calculated on a sliding scale. All royalty charges are paid to the appropriate organisation and no handling costs or additional fees are retained by the auctioneer. Resale royalties are not subject to VAT. Please note that the royalty payment is calculated on the rate of exchange at the European Central Bank on the date of sale. While Clarks Auction Rooms has attempted to ensure the accuracy of all information published on this website; it is possible that some sections may be incomplete, out of date or incorrect. It is therefore essential that you verify all such information with us before taking any action in reliance upon it. It is a condition of us allowing you free access to the material on this web site that you accept that we will not be liable for any action you take in reliance on the information provided. In no event will the company or its directors, agents, or suppliers be liable punitive or consequential damages such as damages for work stoppage, computer failure, Internet or power outages, malfunction, lost profits, lost business or lost opportunity, or any other similar damages under any theory of liability (whether in contract, tort, strict liability or any other theory), even if the company has been informed of the possibility thereof.